When CDs hit the market in the early ’80s, several samplers, musical assortments, appeared. Some were promotional discs, while others were sold at retail. The promotional discs were used in varying manners. Some were provided to music and audio reviewers. Some were provided to retail stores to facilitate demonstrations of the new format. Some were used in a similar fashion at industry trade shows. Some were even given away with CD players. As would be expected, many of these early samplers were pressed in Japan or West Germany. Some early CD samplers covered a given theme, such as rock or pop compilations, while many others featured popular artists of the time on a given record label. Since we are talking of the 1980s, it should not be surprising to find that many of these samplers had a sci-fi theme and treated the CD as a sort of space-age technology. Many of these early samplers, especially the promotional discs, are quite rare. As a collector, I have acquired many of these promotional and commercial samplers and thought it would be a good idea to feature one of them here every so often. I actually have featured a couple such discs in the past. Back on July 4, 2007, I posted the rare Japanese sampler from Epic/Sony, American Best Selection, which featured Epic/Sony artists that had topped the U.S. charts in the early ’80s. More on this sampler may be found here. On March 30, 2008, I posted The Edison CD Sampler, which is a rare CD sampler of early Edison recordings. You may find that post here. Continuing on, I decided to feature here an unusual sampler issued together by Sony and WEA (Warner-Elektra-Atlantic) entitled 20 Years of Golden Greats. This is a rare promotional compilation of WEA artists. The disc and inserts bear the Sony logo, suggesting that this sampler was used by Sony to promote the CD format. The copyright date on the disc is 1984, and the disc was pressed in West Germany by Polygram. Unfortunately, I do not know where this sampler was issued or to whom it was distributed. 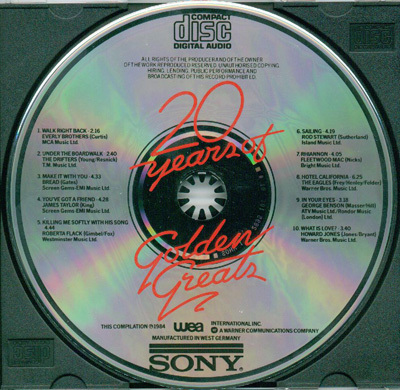 The label side of the 20 Years of Golden Greats CD shows no catalog number, but the inserts show the simple catalog number SONY I (roman numeral I). The matrix code on the disc is “SONY 1 2895 101 01 #”. Shown below is the disc, front cover, and back cover, where you can see the track list for this sampler. Over time, I will highlight other promotional and commercial samplers pressed in different countries and issued in different markets. 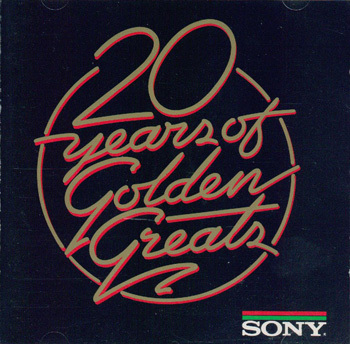 The rare promotional sampler, 20 Years of Golden Greats (Sony/WEA, catalog number Sony 1). The disc was pressed in West Germany by Polygram and bears a copyright date of 1984. The disc is a compilation of WEA artists and was presumably used by Sony to promote the CD format. The matrix code is “SONY 1 2895 101 01 #”. The disc is not actually labeled a promo, but a promotional statement appears on the back insert (see the third picture below). The cover for the promotional sampler, 20 Years of Golden Greats (Sony/WEA, catalog number Sony 1). 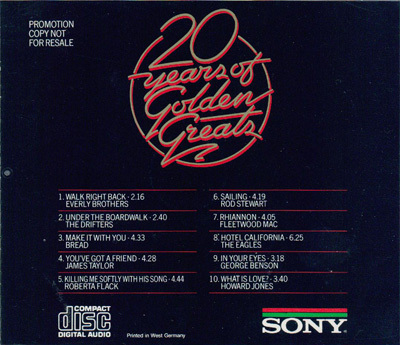 The back insert for the promotional sampler, 20 Years of Golden Greats (Sony/WEA, catalog number Sony 1), showing the track listing. Despite the presence of the Sony logo, all artists are from WEA labels (the disc, shown above, bears both the WEA and Sony logos). Note the promotional statement in the top left corner. As can be seen at the bottom, the inserts were printed in West Germany. Update: The poll associated with this entry closed on October 22nd. The results are shown below. Thanks to all who voted!